As an invisible sense, hearing is one of those things we take for granted, until one day, we notice that something is amiss. The sooner we start paying attention to our hearing, the sooner we can act if we notice our hearing abilities begin to change. Today, we will focus on one major form of hearing loss: sensorineural hearing loss. There are two main types of hearing loss: conductive (which pertains to the outer and middle ear) and sensorineural (which affects the inner ear). According to the American Hearing Loss Foundation, sensorineural hearing loss is “the most common type of hearing loss, occurring in 23% of population older than 65 years of age.” Sensorineural hearing loss pertains to the inner ear area, which is made up of the auditory-vestibular nerve, the cochlea, and the vestibular system (which consists of semi-circular canals). Sound waves enter the ear and are transformed by the inner ear into signals that are sent to the brain by the auditory nerve. The brain then registers this signal as a sound. Sensorineural hearing loss occurs when there is damage to the cochlea or the nerve pathways between the inner ear and the brain. This kind of hearing loss, often permanent, has different causes. Sensorineural hearing loss may be congenital, meaning it is caused by inherited genetics. In some cases, the malformation of the inner ear results in hearing loss. Otosclerosis (a hereditary bone disorder) and Meniere’s disease (a disorder of the inner ear) are both causes for sensorineural hearing loss. Certain infections transmitted from mother to infant may lead to sensorineural hearing loss as well, such as rubella or human Cytomegalovirus (HCMV). In terms of acquired diseases, mumps, syphilis, bacterial meningitis, and autoimmune diseases may all contribute to sensorineural hearing loss. Unfortunately, some medications used to treat the aforementioned diseases may also cause sensorineural hearing loss by irreparably damaging the hair cells of the inner ear, which do not regenerate. This problem is known as ototoxicity, or “ear poisoning.” Though there are at least 100 classes of drugs that cause inner ear hearing loss, the most common ones are aminoglycoside antibiotics (used to treat bacterial infections, such as meningitis), loop diuretics, and antimetabolites. Researchers are currently in the process of finding alternatives to these drugs, as well as patenting a new aminoglycoside antibiotic that is effective in fighting the specific disease without damaging inner ear cells. Physical trauma is another common cause for sensorineural hearing loss. Injury to the temporal bone may affect the cochlea, while other head and neck injuries may affect the auditory system. Tumors in the head and neck area may also cause sensorineural hearing loss by creating pressure against certain processing centers of the brain and within the inner ear. Changes in air pressure, such as on an airplane, may also contribute to sensorineural hearing loss with inner ear fluid leakage. Exposure to loud noises, 90 decibels and higher, for an extended period of time, may also cause sensorineural hearing loss. 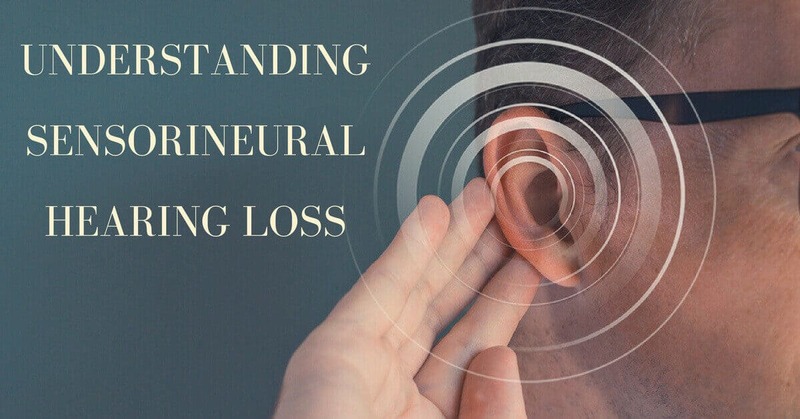 In some cases, people who suffer from sensorineural hearing loss may also experience tinnitus, a condition in which one hears a sound within the brain without an external stimulus. Sensorineural hearing loss is identified during a hearing test, as well as the extent of hearing loss. The accumulation of a lifetime of exposure to loud noises, whether through work or play, has an adverse effect on one’s hearing health. If the noise is related to your employment, consider having a discussion with your human resources department. The use of earplugs could make a big difference in preventing hearing loss, especially when one is exposed to loud decibels on a regular basis. At home, there are sounds that could harm our hearing. Whether it is the constant use of a hair dryer, or a weekly mowing of the lawn, or even the infrequent, do-it-yourself construction projects with power tools, these moments add up over the years. The use of earplugs or protective over-the-ear gear in these moments is recommended to prevent small levels of damage. Researchers have recommended the use of noise-canceling, over-the-ear headphones in these circumstances; it is better to cancel out extraneous noise in order to hear your music than it is to turn up the volume. Consider playing media over speakers if possible, with the volume adjusted to a moderate decibel. Researchers have recommended using the 60-60 method: listening to your media at 60% of the volume for no more than 60 minutes at a time. If you have experienced changes to your hearing or you are concerned about your hearing abilities, contact us at Roseville Diagnostic Hearing Center. Our team is here to support you through your journey to better hearing health.